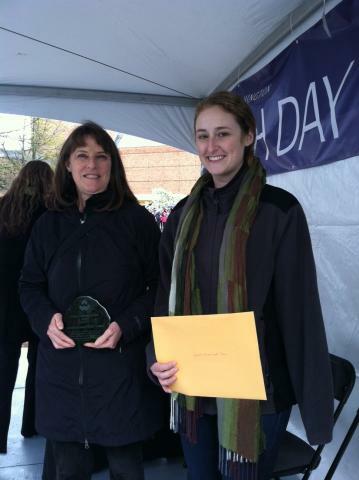 In 2013, the seven Husky Green Award recipients below were recognized at the UW Earth Day celebration. Seventeen nominees were nominated by their peers, including thirteen individuals and four groups. 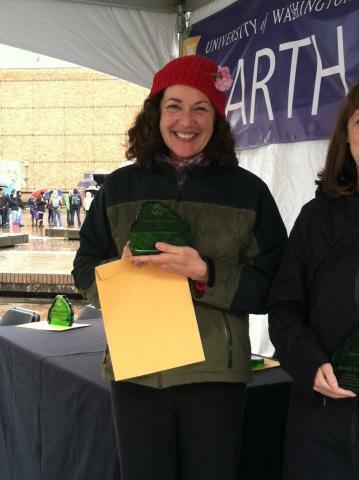 Brenda is a committee member of the Harborview Medical Center’s Environmental Committee. Brenda’s role has been instrumental in HMC receiving recognition from Practice Greenhealth, the nation's leading membership and networking organization for healthcare agencies committed to sustainable, environmentally preferable practices. Currently, Brenda is working on rolling out an institution-wide program for managing pharmaceutical waste. Duncan graduated from the Evans School and served on the Campus Sustainability Fund Committee for two years, he acted as Chair of the Committee in his second year. 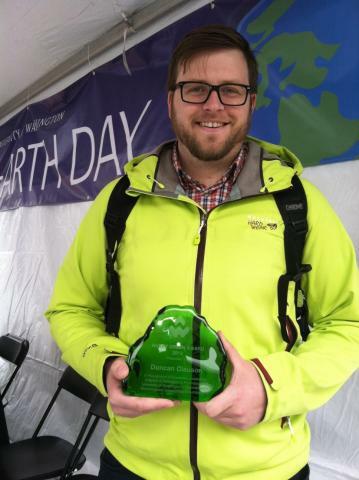 Duncan worked on the Smart Grid Residence Hall project rollout and recently helped lead the UW-Solar project. Duncan's commitment to sustainability was evident in his tireless commitment, passion and engagement with his fellow students and interaction with faculty and staff. Facilities Construction Shop 54 was responsible for rescuing and reusing wood from a tree that was cut down due to elm tree disease. The wood from the tree was later repurposed to create a conference table for the Facilities training center. 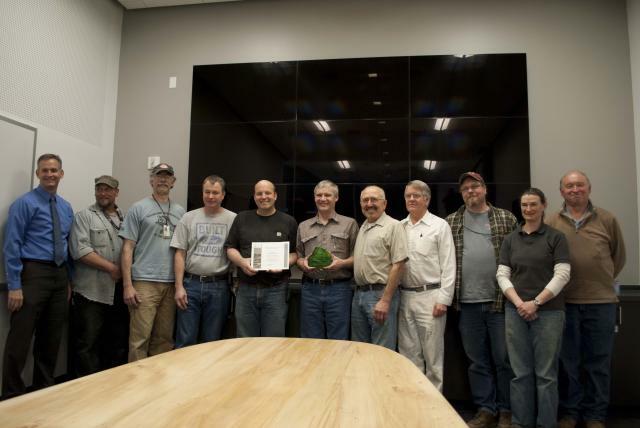 The transformation from tree to table required dedication, creativity and collaboration between Facilities crews, outside vendors and architects. The Gould Green Wall Team is led by students from the Green Futures Lab, faculty and staff designed and installed the campus’ first-ever “green wall”, an edible green screen and water harvesting demonstration project. The project will provide educational opportunities for students and staff about the building and local air temperature. 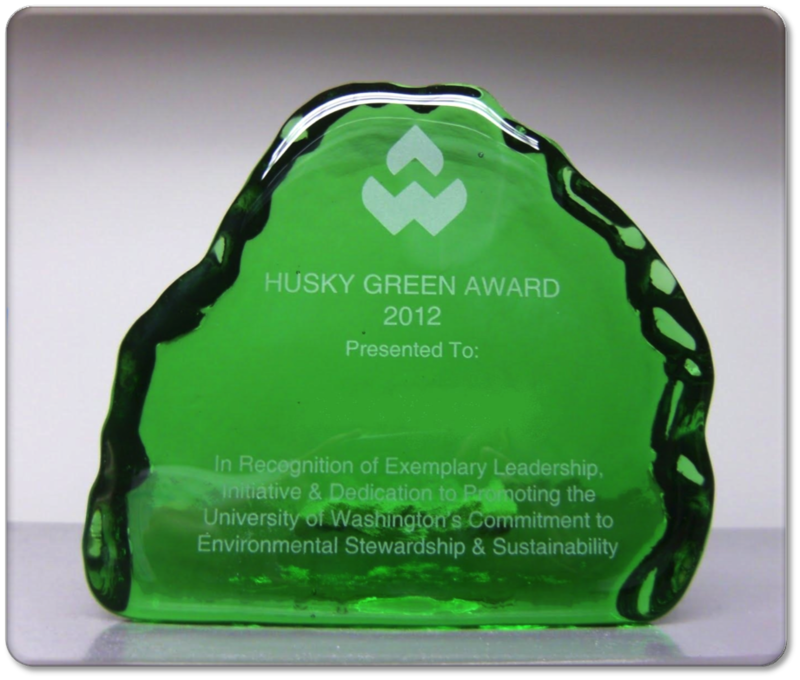 The U-PASS Advisory Board is the first-ever to receive the Husky Green Legacy Award. The board is composed of nine student representatives - three from GPSS, six from ASUW - two non-voting Advisers, and one non-voting student liaison. 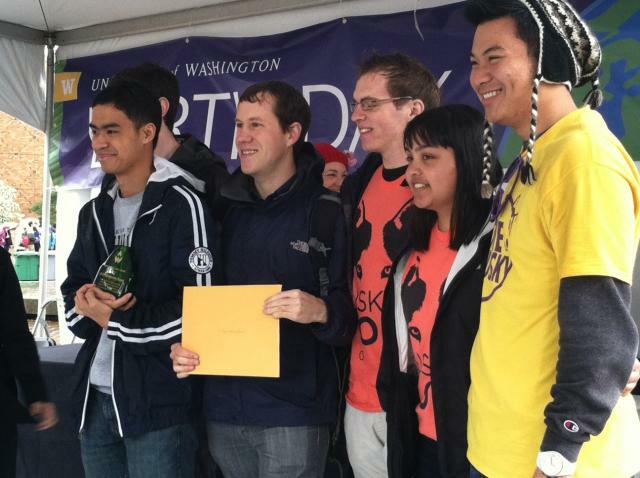 Student leaders established the Universal U-PASS in 2011; the Advisory Board is leading students in their dedication to choosing greener options for commuting to campus. 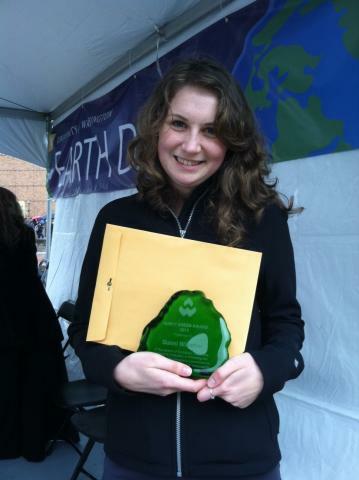 Sunni is a junior in the Community, Environment and Planning Program, an active student member, and serves on both the Environmental Stewardship Committee and Campus Sustainability Fund Committee. Sunni has been integral to many project implementations such as the Husky Sustainable Storms and supporting storm water education for residence hall students. Sunni served as an ambassador for the UW chapter of Engineers Without Boarders and is currently working with UW EWB to design and build improved fish hatchery for a small, impoverished community in Guatemala. Victoria is surgical nurse from UWMC’s operating room. 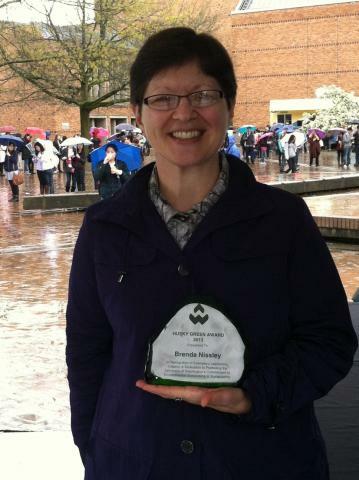 Victoria is responsible for spearheading the hospitals recycling program and worked tirelessly with UW Recycling to increase the hospital’s recycling rate. Since launching the recycling program in UWMC, more than 50% of what used to go in landfill during a surgical case is now recycled, and red biohazard bag use has decreased by 90%. Victoria has been a staff nurse for the surgical department for 12 years. She implemented this program on her own time.